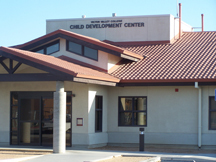 The Victor Valley College Child Development Instructional Lab was established in January 1974. Child Development (CHDV) is an integral part of the Division of Science, Technology, Engineering, and Mathematics (S.T.E.M.) at Victor Valley College and functions as a lab for the Child Development Department. We are located on the upper campus just north of Excelsior in Building 12 (red roof). The Child Development Instructional Lab is licensed by the State of California, Community Care Licensing # 360906573 and provides for the care and education of preschool aged children. For additional enrollment information or to schedule a visit to the CDLC, please call (760) 245 - 4271, extension 2618 or e-mail: Deydalia.Fraydealfaro@vvc.edu. If you are interested in the Preschool Services Department~Head Start Program which is located at the same facility, please call 760.952.1215 directly for assistance.